I confess I don’t know what you’re saying with this picture. But, it reminds me that modern America is depressingly ugly. Are there actually two Taco Bells? It’s often the case that they have one sign on the main road and then another sign on their building. At least I see McDonald’s do that. How do you like your hash browns? The positioning of the fence and the stoplights is critical to any understanding of this photo. Oh, I don’t know that I’m saying anything very thought out. On driving across country it occurred to me that lots of places in America look like that, but you never see it represented that way, whether viewing television or photographs or whatever. I don’t think I agree with Socrates that it’s depressing — there are lots of pretty places in America too. On the other hand, I don’t particularly like the way it looks either. A few years ago I was driving across Louisiana on I-10. Somewhere along the way I exited for gas and noticed that the exit was home to four Waffle Houses, one on on every corner. I love Waffle House! Reminds me of home. I like your small towns. I like your big cities. I like your farms and your forests and your seaports. And it’s because I like you that I say you deserve better than this. This is just not beautiful at all. Lots of things that are done to the American landscape are things I don’t like. Then I reflect on how some of those things I don’t like represent the aspirations of individuals, the tension and exhilaration of doing a job together, and I start to like some of them a little more. For example, when I’m riding my bike out in the country I am often saddened to see the familiar prairies and woodlands torn apart to make new housing developments. Then I think of the construction workers taking pride in their accomplishments, and the families enjoying life together in the new homes, and my sadness is tempered a bit. I agree completely, Conor, that there are a lot of pretty places in America. I’d go farther and say there is an abundance of beautiful places in America. But the key word was “modern”. I’m not saying there aren’t modern beautiful environments; there are. But the picture you show here is depressingly representative of modern construction/design/environment. Worse still, even regional differences are disappearing, as modern America looks more and more homogeneous. And depressingly ugly. We’ve been driving to Chicago from St. Louis regularly over the past 15 years or so. As we watched the freakishly-similar suburbs pop up along 55, the joke became, how do you know when you’re in YOUR neighborhood? Maybe it doesn’t fit your aesthetic sense, but I would have been GLAD to see these signs on several occasions while driving across the country in a VW van that didn’t have much pep. Once, we got stranded in South Dakota with a gallon of gas in the tank, unsure whether that gallon would get us to the next station. So we sat in the parking lot of a gas station from 4 am until the station opened at 9 am. Convenience isn’t always pretty. But prettiness isn’t always convenient. I think there’s room for both. 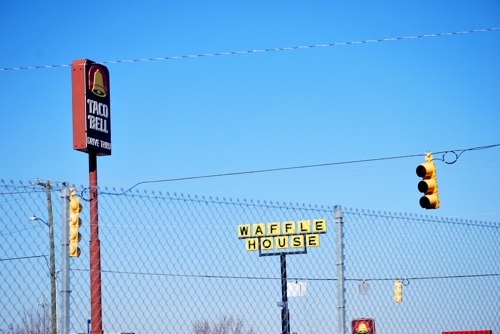 PS: Both Taco Bell and Waffle House are awesome. Maybe not authentic, whatever that means. But a 7-layer burrito is a thing to behold at 3 am, especially when all you have to offer is a handful of sweaty nickles. There are some people who bemoan the sameness of MacDonalds and Taco Bell across the land, and mourn the loss of regional differences in our culture. Some of those are the same people who want our health care system to be a uniform, national monopoly run by the national government. Those people slay me. This country had a wonderful opportunity to have a discussion about health care, but unfortunately, what we had instead was conservatives and libertarians lying— lying— about the merits of the plans that were being discussed, and the discussion proceeding from those lies. It’s an utter shame.